N.B. Supplied in sections for bolting together on site. Easy to assemble. Working in a warehouse often involves working at height; it is extremely important health and safety procedures are in place, as well as providing employees with stable equipment to help them work safely at height. Our aluminium warehouse steps are a great addition to help your employees work confidently and safely. They have serrated rubber feet to keep the steps firmly in place while in use, offering greater stability for the user. 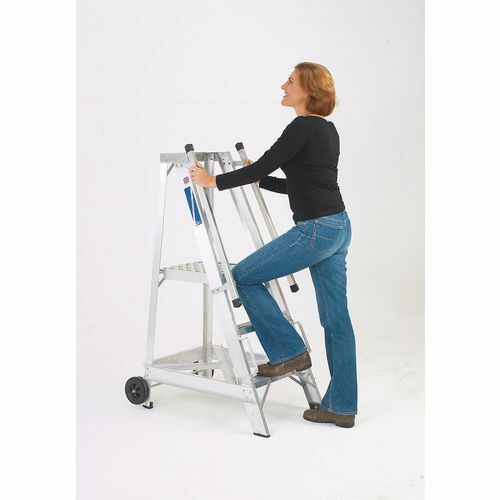 There is a spacious platform, up to 450mm x 370mm, providing ample foot room for the user, assisting them in concentrating on the task they are performing. For safe ascent and descent there are handrails fitted to both sides of the steps. They are fitted with wheels to the rear for ease of movement and there are slip-resistant ribbed treads 80mm deep for excellent underfoot grip. 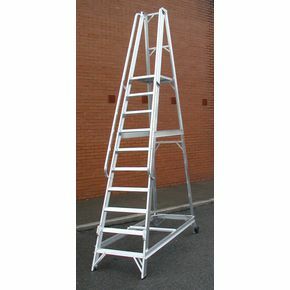 These steps are available in a choice of ten platform heights; 740, 980, 1230, 1470, 1720, 1960, 2210, 2450, 2940 or 3430mm. 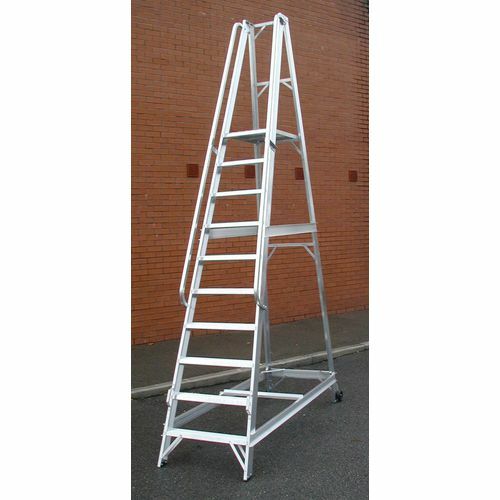 Our aluminium warehouse steps great pieces of equipment to provide the user with an easy and stable way of working at height. They come with a 12 month guarantee and FREE UK Delivery.